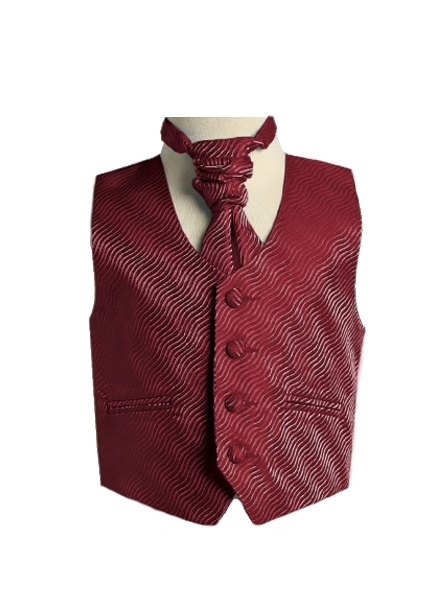 DapperLads - English Vest w Ruche Tie Cravat - Burgundy - English & Full Dress Vests - English vests with ruche ties. Rugged Butts formal vests, argyle golf sweater vests with argyle knee socks. The fancy and unique English style of these vests and ties makes them a hit for special occasion boys wear. The material is a tone on tone wave pattern in a rich burgundy color. 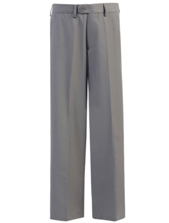 The lined full vest features covered buttons and welt pockets. The back is a solid color 100% polyester. The pre-tied scrunchy cravat / ruche tie has an easy, no-fuss Velcro closure. From Tip Top US. Note - Size 2 has sold out. The chest measurement at the third button: Size 4 is 26", Size 6 is 28" , and Size 8 is 30". The length measurement from the shoulder to the vest point Size 2 is 13", Size 4 is 15 1/4", Size 6 is 17 1/4" , and Size 8 is 19".